Chicken Momos, made with love and....whole wheat! Momos or steamed dumplings have always been one of my favourite foods. It never fails to remind me of winter mist even if I am standing at a momo stall in the middle of the day with a blazing sun scorching my back. I may be having momos in Bangalore but at that moment, I could very well be in Shillong, shielding my plateful of momos from the perennial light drizzle. I like it best when the momos come paired with a bowlful of steaming hot clear soup. There is nothing better on a foggy, wintry evening than slurping on peppery soup and alternately taking little bites of momos dunked in spicy red chutney. I remember feasting on momos whenever we visited hill stations. There would always be an amiable Tibetan lady selling a bunch of them, standing quietly by the bustling mall road with her wares. “Finish the momos fast or they will become cold,” she would urge us with maternal concern. She was right, there should be no break for chit chat while having momos. They are best eaten hot, with perhaps a few ‘haaaah, haaah’s, expelling the vapors from our burning mouths! 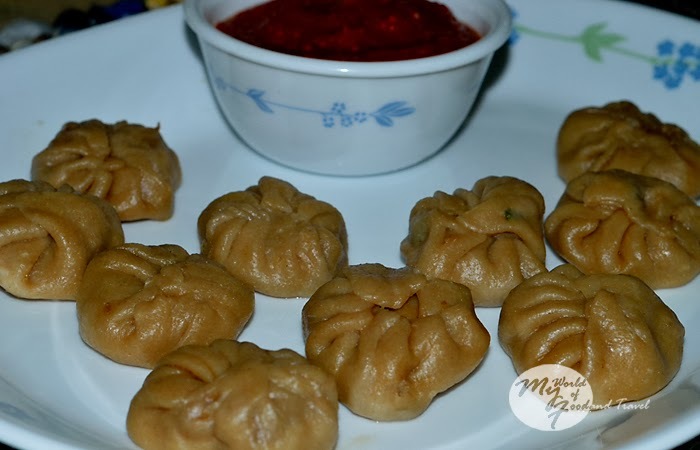 I have tried a few times in the past to replicate the momos in my own kitchen. To utter failure. Each time, every time. Although the husband gallantly offered to differ, I know he was just being nice. Finally, this weekend we brought home a brand new steamer. This time, I could not fail. I decided not to look up any recipes on the net and just follow my own instincts. I debated for a long time whether to make the momo wrapper from maida (refined flour) or experiment with atta (whole wheat flour). Finally, the husband stepped in and pushed me towards atta. “But where have you heard of atta momos?” I was still not very convinced. And so I did. Would you believe it, but they actually turned out really well! And I beseech you, please don’t go by the pictures – they looked horrible, I know, but they tasted as good as maida momos! I used the sauces that I had in my kitchen shelf in the chicken mince. You can put in your favourites, too. Mine is a freewheeling recipe, so put your own twists and twirls and I am sure you will have a better dish! First, let’s make the dough for the momo wrappers. Combine all the ingredients and knead into soft, pliable dough. Cover it with a damp muslin cloth and keep aside for around 15 minutes. Now, you can choose to roll out individual discs from the dough, a little smaller than puris, or you can do what I did. I cleared out my kitchen counter and dusted it well with flour. Then, I rolled out a huge roti and cut out small circles using my drinking glass. I have to take a little pride here in saying that I can make really thin rotis and so I was able to roll out the dough quite thin. For the filling, combine all the ingredients together. Now, take a spoonful of the mince mixture and place it in the centre of the momo wrapper. Pull the edges to cover the mince and resemble a tight fist. 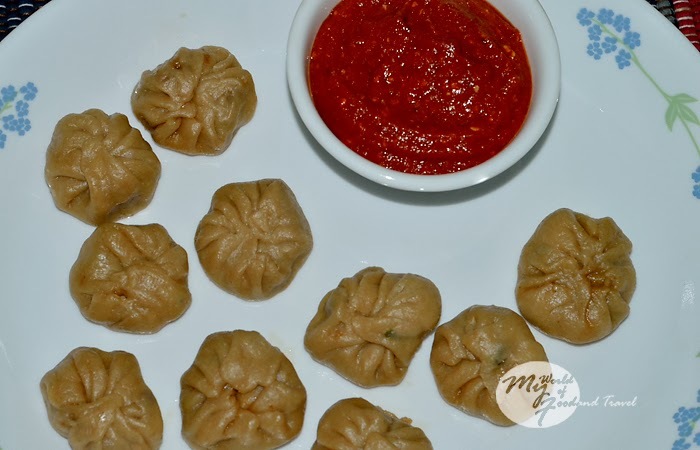 You can also make crescent shaped momos, like gujias. Finally, steam the momos for around 20 minutes. In case you don’t have a steamer you can choose to cook the momos in a vessel of boiling water, taking care not to lower the heat at any time. I had done it the last time but umm, well, they had not turned out quite the way I wanted them to be. 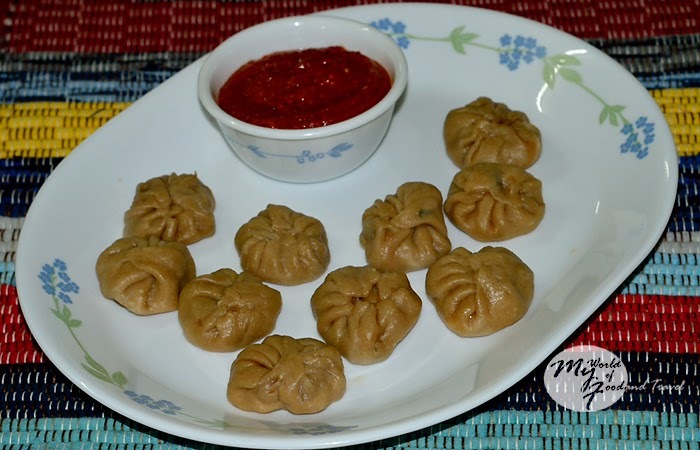 Now, the momos are nothing without the fiery red chutney; they would be incomplete, really. For that, I whizzed together a handful of dried red chillies (soaked in warm water for 15 minutes), some garlic and a small tomato in my mixie. Season with a pinch of salt and your chilli-garlic chutney is ready! I was first taken aback to see my momos a shade of dark brown when I took them out of the steamer. Momos were always these little white fluffy pillows, no? Oh right, I made them with atta! I took a deep breath and offered him the first momo. Silence, and then, “Brilliant,” he said. Phew, I passed the test! The momos, despite their ugliness, were really soft and juicy and the wrappers encasing them were thin and did not taste doughy at all. The sauces in the mince had packed in tons of flavor and also kept the filling moist. Their sweetness was complimented by the sharp chili-garlic chutney. In no time, my bite sized, brown little momos had disappeared. Those tiny fists of balls had really punched in some flavor! There, you have it, my DIY recipe for chicken momos. How about making a batch now? Thank you so much! I thought the pics were really hideous! And veg momos are amazing, too. They do? Oh thanks, ilakshee!